I strive to make each holiday special for my kids. and traditions for my kids that will last forever. even if it is just the four of us. 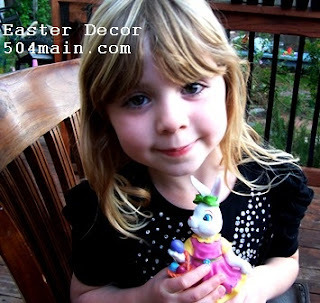 We have already had a few egg hunts around here...and at preschool, and so my kids, especially my daughter is so excited for Easter and the Easter Bunny, and the candy, and well anything that has to do with Easter. 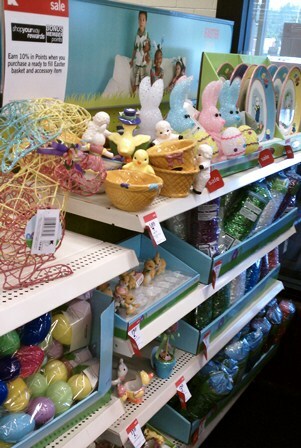 Even with all of my good intentions, I will admit, I am a last minute decorate...but luckily for Jules we had the amazing opportunity to head to Kmart and get our house Easter ready ahead of time! I found the Celebrations by Radko line to be charming and it reminded me of the sweet vintage figurines I pick up whenever I see them. I was feeling a little nostalgic...and my daughter was swooning over the little lambs and bunnies and chicks. We browsed the selection online, and then I made a list of what I needed..or thought I needed. 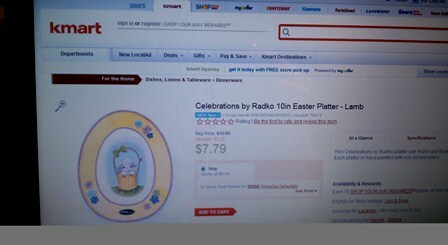 We had to head out to a Kmart about an hour away to purchase our supplies, in particular the Celebrations by Radko line. and to top t off, Kmart had great prices on everything! You can read more about my shopping trip on Google+, right HERE! I have neglected my front porch, so I cleaned the whole thing off - swept, sprayed it down and got it ready for it's Easter makeover! Our porch is covered and I always have a table and two chairs out there. So I was definitely working around those. 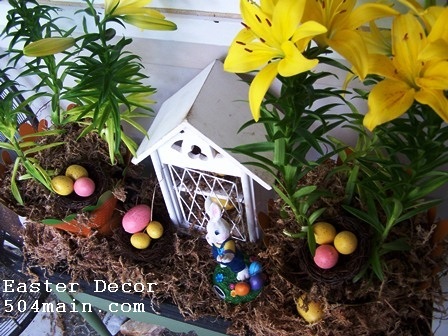 Now, let me take you on a tour of our Easter Porch! 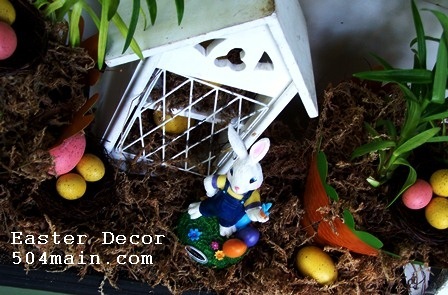 I purchased some metal "carrot" planters, Asiatic Lilies, and the Boy Bunny figurine to use on the table. 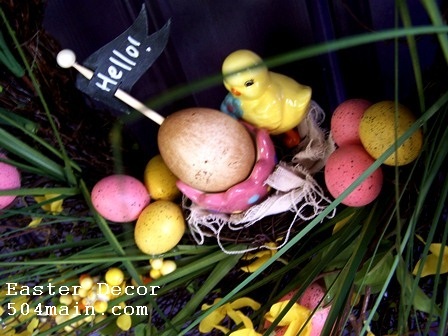 Added some moss (because I love texture and layers) and a birdhouse and the paper bunny banner I made...and voila! 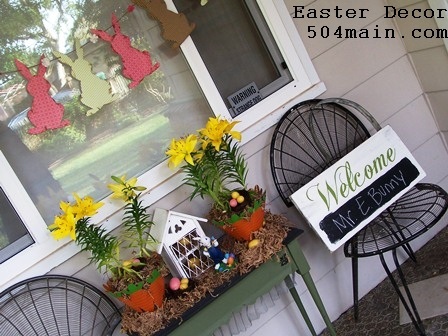 Now we have a little Easter habitat happening on the front porch. 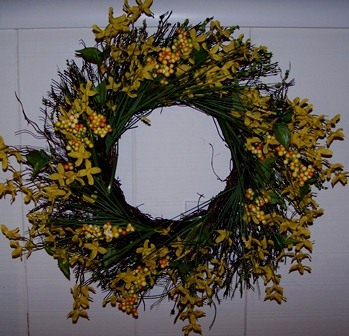 as well as on the wreath. so I added some details to it. Hot glue was my friend for sure. And I LOVE the final product. 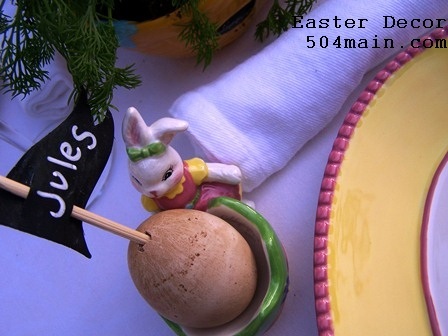 and one of those darling Celebrations by Radko egg holders. It was looking so sweet! made a little chalkboard pennant for that chick to display. 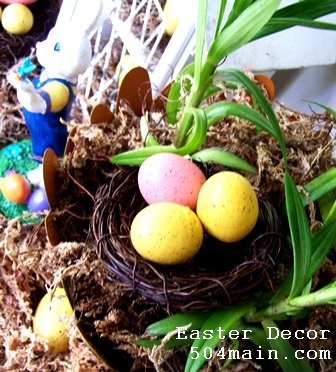 maybe I will even invite some friends over for an egg hunt at home? she wants it all in her room! 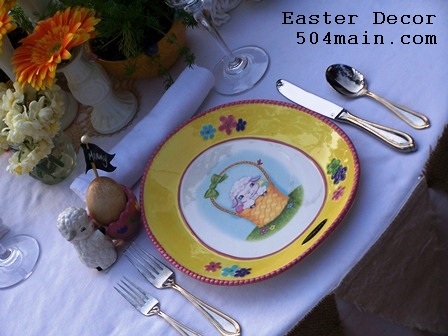 we could use for our Easter brunch (that is our big meal of the day). so outside I went with my table and chairs, and my serving cart! like by new Celebrations by Radko decor. and don't get too fussy with the decor. and almost always with a bit of a handmade feel. I think this table captures just that. I began with the basics..the linens. but I LOVE the layers and colors peeking out from under. 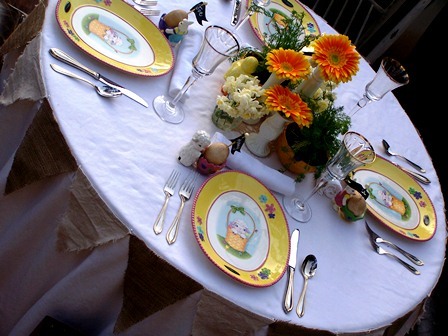 I layered a green cloth, some burlap (which I like to keep away from the food), and one of my newer bright and cheery yellow cloths, and then topped it with a white cloth. 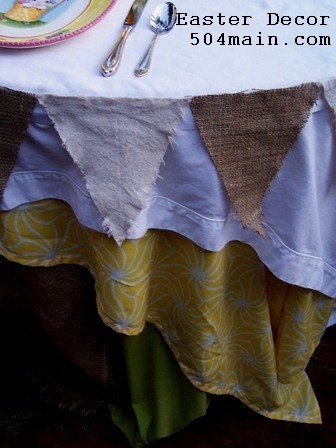 Around the top of the table I attached a very simple pennant banner I made from burlap and drop cloth (super easy - all simple shapes and hot glued together!). I love this look - fun, elegant, and not too fussy...and slightly unexpected. 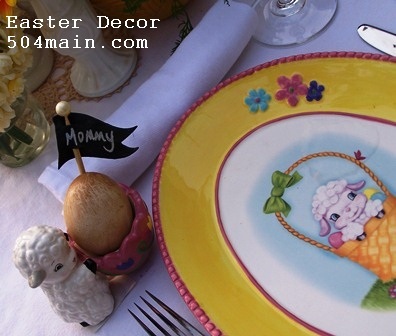 On the tabletop, I loved the addition of the Lamb Easter platters. 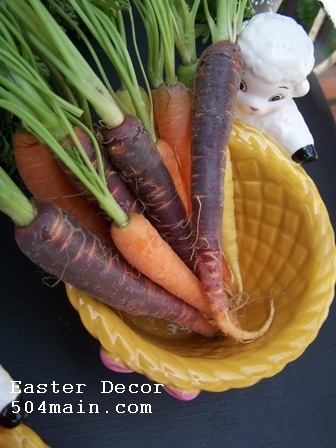 For us they were the perfect size to use as a plate...and my daughter begged me to use them as a plates for Easter brunch (I have a feeling we will be using these for months and months). They are bright and colorful and oh so sweet. 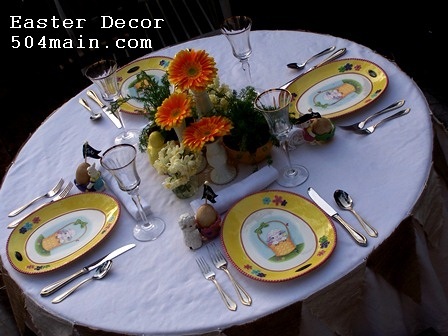 I rolled a simple white napkin and placed one of the egg holders by each place setting; a Boy Bunny for Joe, a Girl Bunny for Jules, and Lambs for the adults. 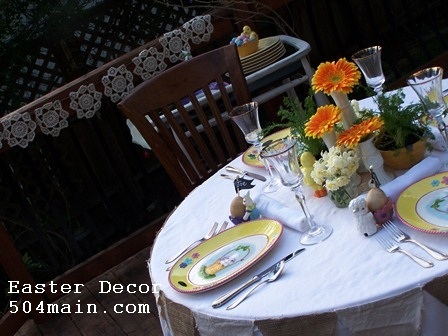 Just as on the wreath, I used a tea dyed blown egg with a pennant...but this time as a place card! For the centerpiece, I truly kept it simple. 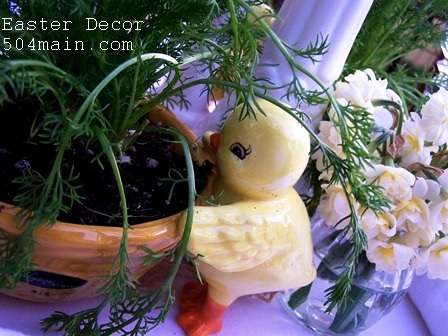 Those chick candy bowls were begging for a plant...so chamomile it was...I love this unexpected twist! 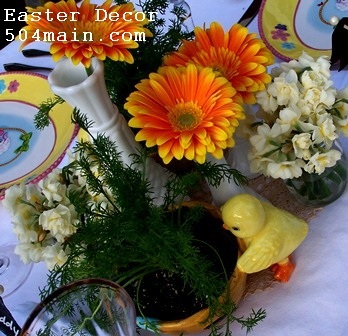 I also used some milk glass vases from my collection, each with a single Gerber daisy, and then a couple of small jars with Narcissus. 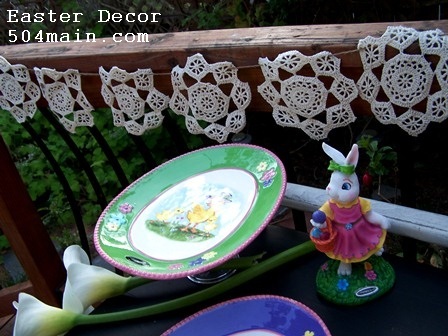 All of these simple elements look vibrant and inviting when grouped together. 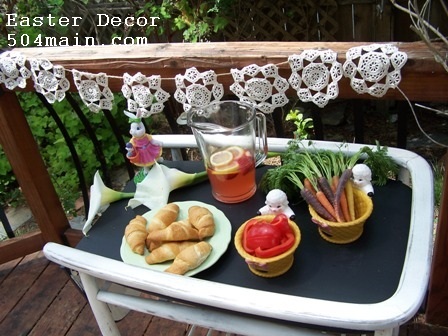 I made a serving cart awhile back and it comes very handy when we eat on the deck. I used two other platters on the cart for serving. For one of the platters, I attached a glass taper holder to elevate it (I wanted mine to be temporary, so using candle wax or museum putty will work. If you want something permanent, a heavy duty glue is the best idea). 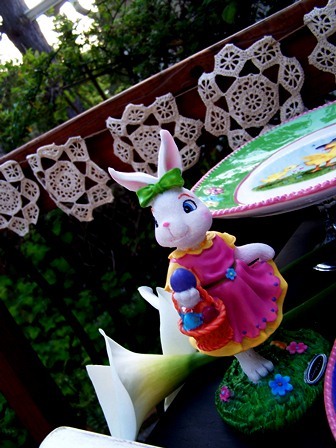 And of course I also picked up the Girl Bunny Figurine (I do have a boy and a girl living here!) and she stood watch over the cart and table. Finally as a backdrop to the festivities, I made another bunting/banner. This time I cut apart the Country living table runner (that I purchased at Kmart) and strung it with some simple twine. I think it provides a simple, vintage charm that compliments the Celebrations by Radko so nicely! Here is the whole scenario "in action." and at how I will greeting my visitors this season! Come on now...how can you resist this? Oh yeah...Jules, well, she won...the Girl Bunny is now "hers." But she says I can borrow it if I need to. It is all so beautiful Holly! Can I come over for a tea party? That is some serious cuteness with the table decor! Makes me want to go back & purchase some of those plates I saw. I love how you put the banner around the table too! 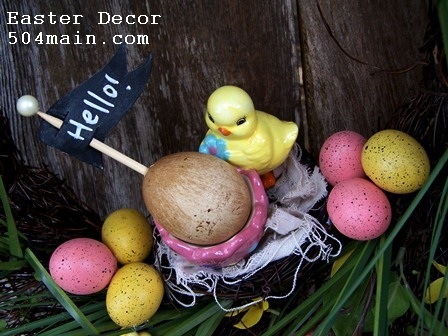 & the name tag egg holders! So cute! 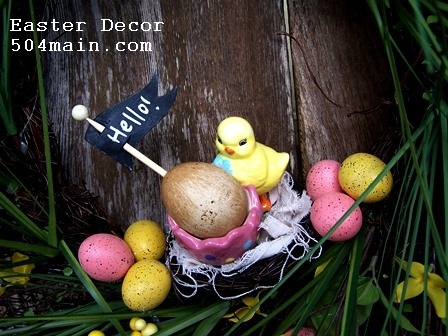 I am over @ DearCreatives & visiting from the #SF Hope you enjoy your Easter! Awesome!!! 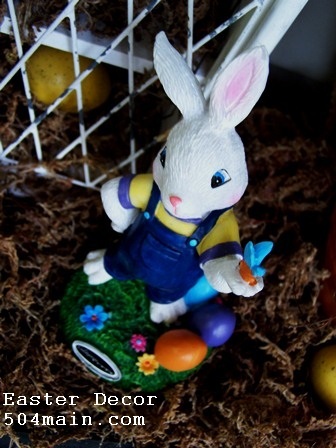 Loving the Mr. E bunny sign... everything is so beautiful! 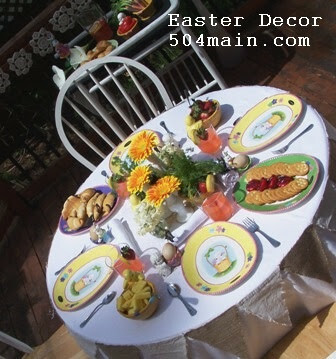 I love it all, Holly...your girls (and you) have to feel "eggstra" special now when Easter rolls around...just lovely! 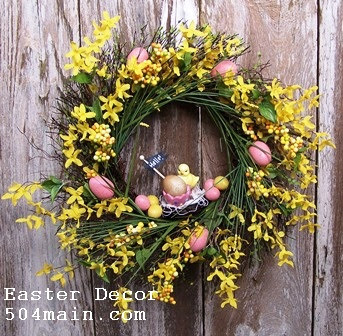 So so darling...Yes,those egg holders do have such a sweet vintage flair...and your wreath with the little egg and flag coming out saying "Hello" adorable...Your bunnies look great, I didn't realize they were so big. 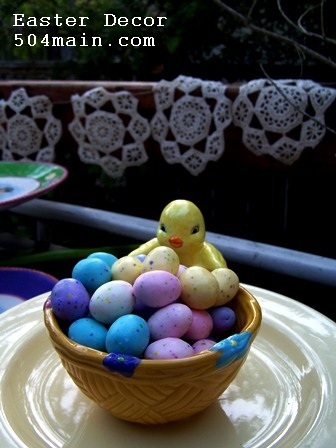 I am planning an Easter egg hunt for the grandbabies, so excited. 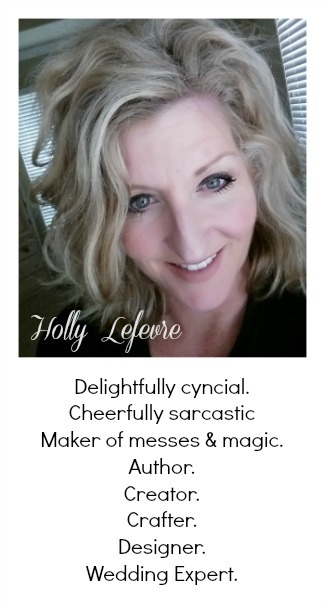 Definitely impressed by the wonders you created, Holly! Sweet, chic and so creative! This looks amazing! You thought of every detail. 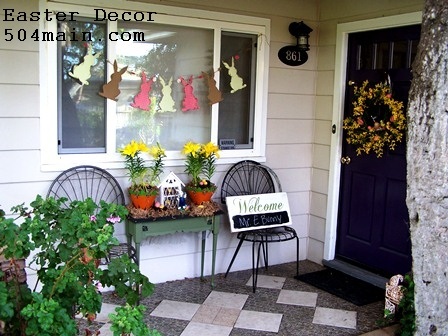 Love your front porch all decked out and I love those plates from kmart! I pass one on the way home from work so I just may stop in.. 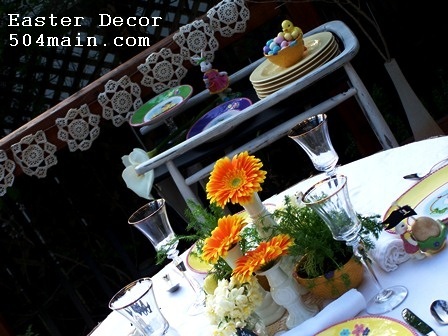 The front porch looks beautiful the table amazing, great job!! I love your darling decor!!! I Really wanted those radko bowls after I saw them on the website but none at my store - and just a couple egg holders left that I grabbed. Guess they were pretty popular all around! :) I also ove your wreath and how you embellished it too. Soo cute!! Everything looks amazing and I too want to come over and play! But I just have to point out that those place cards are my FAVORITE! It's all just beautiful though. 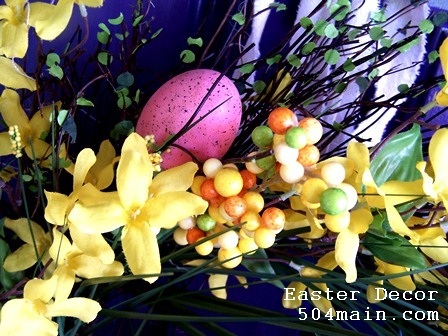 What a fun Easter you are going to have this year! It's all so pretty and springy! Yours must be the most festive house on the block! Everything looks perfect! 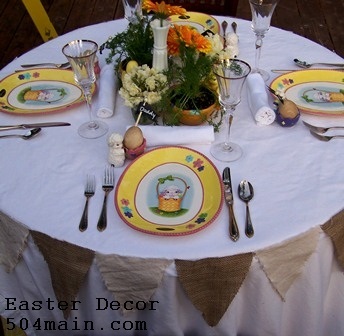 Your table setting is totally adorable, love the burlap flags around the table, so creative! Happy Easter! Loving your front porch!!!! Mine has been totally neglected this year, and this gives me inspiration to spruce it up tomorrow! Happy Easter!! Lovely!! 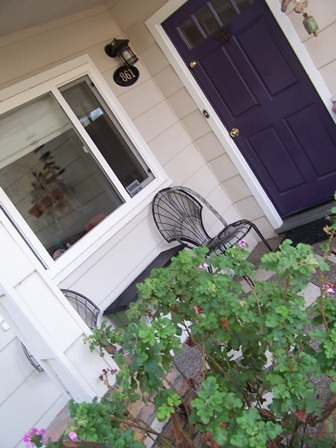 I love your front Porch so cute!! Table is fantastic too!! Love it! 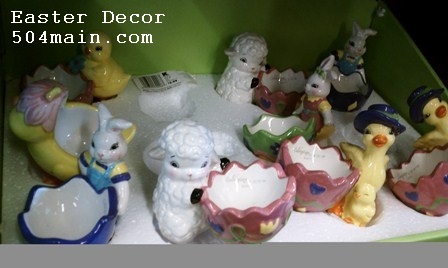 Such cute Easter items! Happy Easter to you and your family!! ps I am putting this on my FB in a few minutes! New Dining Room Chairs...in the Works! Pick Your Plum $75 Crafting Swag Giveaway! Tickled Pink No. 93...Announcing 2x the fun!